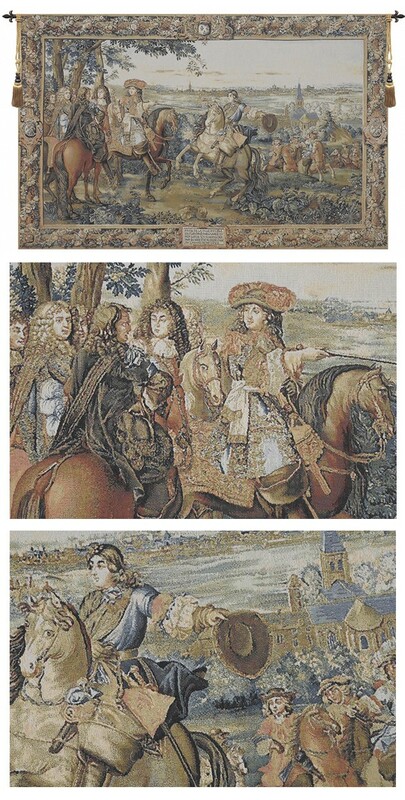 Commissioned to celebrate the life of Louis XIV (1638-1715), this tapestry is based on one of 14 in a series known as “L’Histoire du Roi” (The History of the King). It shows Louis XIV touring the city of Lille shortly after its capture in 1667, the original of which was made by the famous Gobelins Manufacture in France. His military commander Tureene, and his chief military engineer, Vauban, accompany him. The fall of Lille was significant because it signaled Louis’ intent to invade Spanish Netherlands. In the intervening years, the war emptied the country’s reserves and France’s influence in Europe dwindled. This absolutely magnificent Gobelins tapestry is superb in its ability to capture this historical period in brilliant detail, in the foliage, right down to the outfits the approaching cavalry are wearing. The elaborate border of foliage and coats of arms emblems deliciously completes this beautiful work. This art tapestry "Louis XIV - Lille" is lined and has a tunnel for easy hanging. Dimensions: W 58" x H 37"
Dimensions: W 88" x H 56"
Dimensions: W 165" x H 102"
Dimensions: W 180" x H 116"